Emil Cioran (Romanian: [eˈmil t͡ʃoˈran] ( listen); 8 April 1911 – 20 June 1995) was a Romanian philosopher and essayist, who published works in both Romanian and French. His work has been noted for its pervasive philosophical pessimism, and frequently engages with issues of suffering, decay, and nihilism. Among his best-known works are On the Heights of Despair (1934) and The Trouble with Being Born (1973). Cioran's first French book, A Short History of Decay, was awarded the prestigious Rivarol Prize in 1950. The Latin Quarter of Paris was his permanent residence and he lived much of his life in isolation with his partner Simone Boué. Cioran was born in Resinár (Rășinari), Szeben County, which was part of Austria-Hungary at the time. His father, Emilian Cioran, was an Orthodox priest. His mother, Elvira (née Comaniciu), was originally from Veneția de Jos, a commune near Făgăraș. After focusing on Humanities at the Gheorghe Lazăr High School in Sibiu (Hermannstadt), Cioran, at age 17, entered the University of Bucharest, where he studied philosophy and immediately met Eugène Ionesco and Mircea Eliade, who became his friends. Future Romanian philosopher Constantin Noica and future Romanian thinker Petre Țuțea became his closest academic colleagues; all three studied under Tudor Vianu and Nae Ionescu. Cioran, Eliade, and Țuțea became supporters of Ionescu's ideas, known as Trăirism. Cioran had a good command of German. His early studies revolved around Immanuel Kant, Arthur Schopenhauer, and especially Friedrich Nietzsche. He became an agnostic, taking as an axiom "the inconvenience of existence". While at the University, he was influenced by Georg Simmel, Ludwig Klages and Martin Heidegger, but also by the Russian philosopher Lev Shestov, whose contribution to Cioran’s central system of thought was the belief that life is arbitrary. Cioran's graduation thesis was on Henri Bergson, whom he later rejected, claiming Bergson did not comprehend the tragedy of life. In 1933, he received a scholarship to the University of Berlin, where he came into contact with Klages and Nicolai Hartmann. While in Berlin, he became interested in the policies of the Nazi regime, contributed a column to Vremea dealing with the topic (in which Cioran confessed that "there is no present-day politician that I see as more sympathetic and admirable than Hitler", while expressing his approval for the Night of the Long Knives—"what has humanity lost if the lives of a few imbeciles were taken"), and, in a letter written to Petru Comarnescu, described himself as "a Hitlerist". He held similar views about Italian fascism, welcoming victories in the Second Italo-Abyssinian War, arguing that: "Fascism is a shock, without which Italy is a compromise comparable to today's Romania". Cioran’s first book, On the Heights of Despair (literally translated: "On the Summits of Despair"), was published in Romania in 1934. It was awarded the Commission’s Prize and the Young Writers Prize for one of the best books written by an unpublished young writer. Successively, The Book of Delusions (1935), The Transfiguration of Romania (1936), and Tears and Saints (1937), were also published in Romania (the first two titles have yet to be translated into English). Although Cioran was never a member of the group, it was during this time in Romania that he began taking an interest in the ideas put forth by the Iron Guard—a far right organization whose nationalist ideology he supported until the early years of World War II, despite allegedly disapproving of their violent methods. Cioran revised The Transfiguration of Romania heavily in its second edition released in the 1990s, eliminating numerous passages he considered extremist or "pretentious and stupid". In its original form, the book expressed sympathy for totalitarianism, a view which was also present in various articles Cioran wrote at the time, and which aimed to establish "urbanization and industrialization" as "the two obsessions of a rising people". Marta Petreu's An Infamous Past: E.M. Cioran and the Rise of Fascism in Romania, published in English in 2005, gives an in-depth analysis of The Transfiguration. His early call for modernization was, however, hard to reconcile with the traditionalism of the Iron Guard. In 1934, he wrote, "I find that in Romania the sole fertile, creative, and invigorating nationalism can only be one which does not just dismiss tradition, but also denies and defeats it". Disapproval of what he viewed as specifically Romanian traits had been present in his works ("In any maxim, in any proverb, in any reflection, our people expresses the same shyness in front of life, the same hesitation and resignation... [...] Everyday Romanian [truisms] are dumbfounding. "), which led to criticism from the far right Gândirea (its editor, Nichifor Crainic, had called The Transfiguration of Romania "a bloody, merciless, massacre of today's Romania, without even [the fear] of matricide and sacrilege"), as well as from various Iron Guard papers. 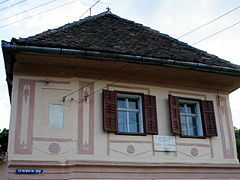 After returning from Berlin in 1936, Cioran taught philosophy at the Andrei Șaguna High School in Brașov for a year. In 1937, he left for Paris with a scholarship from the French Institute of Bucharest, which was then prolonged until 1944. After a short stay in his home country (November 1940 – February 1941), Cioran never returned again. This last period in Romania was the one in which he exhibited a closer relationship with the Iron Guard, which by then had taken power (see National Legionary State). On 28 November, for the state-owned Romanian Radio, Cioran recorded a speech centered on the portrait of Corneliu Zelea Codreanu, former leader of the movement, praising him and the Guard for, among other things, "having given Romanians a purpose". He later renounced not only his support for the Iron Guard, but also their nationalist ideas, and frequently expressed regret and repentance for his emotional implication in it. For example, in a 1972 interview, he condemned it as "a complex of movements; more than this, a demented sect and a party", saying, "I found out then [...] what it means to be carried by the wave without the faintest trace of conviction. [...] I am now immune to it". Cioran started writing The Passionate Handbook in 1940 and finished it by 1945. It was the last book he wrote in Romanian, though not the last to deal with pessimism and misanthropy through delicate and lyrical aphorisms. Cioran published books only in French thereafter. In 1949, his first French book, A Short History of Decay, was published by Gallimard and was awarded the Rivarol Prize in 1950. Cioran later refused every literary prize he was given. The Latin Quarter of Paris became Cioran’s permanent residence. He lived most of his life in isolation, avoiding the public, but still maintained contact with numerous friends, including Mircea Eliade, Eugène Ionesco, Paul Celan, Samuel Beckett, Henri Michaux and Fernando Savater. Cioran died of Alzheimer's disease and is buried at the Montparnasse Cemetery. Professing a lack of interest in conventional philosophy in his early youth, Cioran dismissed abstract speculation in favor of personal reflection and passionate lyricism. "I’ve invented nothing; I’ve simply been the secretary of my sensations", he later said. Pessimism characterizes all of his works, which many critics trace back to events of his childhood (in 1935 his mother is reputed to have told him that if she had known he was going to be so unhappy she would have aborted him). However, Cioran's pessimism (in fact, his skepticism, even nihilism) remains both inexhaustible and, in its own particular manner, joyful; it is not the sort of pessimism which can be traced back to simple origins, single origins themselves being questionable. When Cioran's mother spoke to him of abortion, he confessed that it did not disturb him, but made an extraordinary impression which led to an insight about the nature of existence ("I'm simply an accident. Why take it all so seriously?" is what he later said in reference to the incident). His works often depict an atmosphere of torment, a state that Cioran himself experienced, and came to be dominated by lyricism and, often, the expression of intense and even violent feeling. The books he wrote in Romanian especially display this latter characteristic. Preoccupied with the problems of death and suffering, he was attracted to the idea of suicide, believing it to be an idea that could help one go on living, an idea which he fully explored in On the Heights of Despair. He revisits suicide in depth in The New Gods, which contains a section of aphorisms devoted to the subject. The theme of human alienation, the most prominent existentialist theme, presented by Jean-Paul Sartre and Albert Camus, is thus formulated, in 1932, by young Cioran: "Is it possible that existence is our exile and nothingness our home?" in On the Heights of Despair. Cioran’s works encompass many other themes as well: original sin, the tragic sense of history, the end of civilization, the refusal of consolation through faith, the obsession with the absolute, life as an expression of man's metaphysical exile, etc. He was a thinker passionate about history; widely reading the writers that were associated with the period of "decadent". One of these writers was Oswald Spengler who influenced Cioran's political philosophy in that he offered Gnostic reflections on the destiny of man and civilization. According to Cioran, as long as man has kept in touch with his origins and hasn't cut himself off from himself, he has resisted decadence. Today, he is on his way to his own destruction through self-objectification, impeccable production and reproduction, excess of self-analysis and transparency, and artificial triumph. William H. Gass called Cioran's work "a philosophical romance on the modern themes of alienation, absurdity, boredom, futility, decay, the tyranny of history, the vulgarities of change, awareness as agony, reason as disease". Cioran became most famous while writing not in Romanian but French, a language with which he had struggled since his youth. During Cioran's lifetime, Saint-John Perse called him "the greatest French writer to honor our language since the death of Paul Valéry." Cioran's tone and usage in his adopted language were seldom as harsh as in Romanian (though his use of Romanian is said to be more original). After the death of Cioran's long-term companion, Simone Boué, a collection of Cioran's manuscripts (over 30 notebooks) were found in the couple's apartment by a manager who tried, in 2005, to auction them. A decision taken by the Court of Appeal of Paris stopped the commercial sale of the collection. However, in March 2011, the Court of Appeal ruled that the seller was the legitimate owner of the manuscripts. Amid the manuscripts, which were mainly drafts of works that had already been published, an unedited journal was found which encompassed his life after 1972 (the year in which his Notebooks end). This document is probably Cioran’s last unpublished work. An aged Cioran is the main character in a play by Romanian dramatist-actor Matei Vișniec, Mansardă la Paris cu vedere spre moarte ("A Paris Loft with a View on Death"). The play, depicting an imaginary meeting between Vișniec and Emil Cioran, was first brought to the stage in 2007, under the direction of Radu Afrim and with a cast of Romanian and Luxembourgian actors; Cioran was played by Constantin Cojocaru. Stagings were organized in the Romanian city of Sibiu and in the Luxembourg, at Esch-sur-Alzette (both Sibiu and Luxembourg City were the year's European Capital of Culture). In 2009, the Romanian Academy granted posthumous membership to Cioran. All of Cioran's major works in French have been translated into English by Richard Howard. Cahier Cioran, L’Herne, 2009 (Several unpublished documents, letters and photographs). ^ Robert Wicks. Schopenhauer's 'The World as Will and Representation': A Reader's Guide. Bloomsbury Academic. p. 156. ISBN 1441104348. "Cioran was impressed especially by Mainländer". ^ Bradatan, Costica (28 November 2016). "The Philosopher of Failure: Emil Cioran's Heights of Despair". Los Angeles Review of Books. Retrieved 8 January 2018. ^ Weiss, Jason (1991). Writing At Risk: Interviews Uncommon Writers. University of Iowa Press. ISBN 9781587292491. Ornea, Z. (1995). Anii treizeci. Extrema dreaptă românească. Bucharest: Fundației Culturale Române. ISBN 973-9155-43-X. OCLC 33346781. Wikimedia Commons has media related to Emil Cioran. Cioran.eu – Project Cioran: texts, interviews, multimedia, links. E.M. Cioran on Samuel Beckett The website states that: "Scattered throughout the one thousand pages of Cioran's Cahiers 1957–1972 are many intriguing remarks about Beckett and his work, of which the following are among the more memorable." The Book of Delusions [Cartea amăgirilor] (chapter 5), translated with an introduction by Camelia Elias. Hyperion: On the Future of Aesthetics, Vol. V, Issue 1, MAY 2010. This page was last edited on 22 April 2019, at 05:10 (UTC).